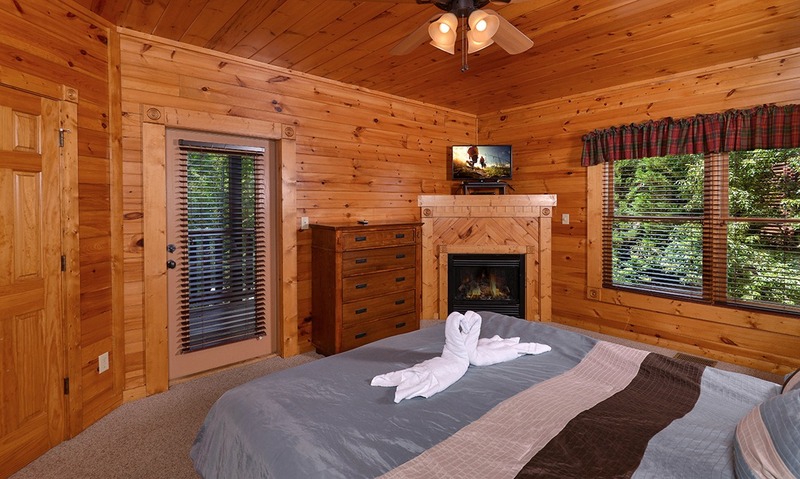 Breathe in deep the therapeutic atmosphere of crisp mountain air, the fragrance of pines, and the faint hints of the log wood of your cabin. Smoky Mountain Escape is the cabin you will love, prescribing in its name exactly what you and the family needed. 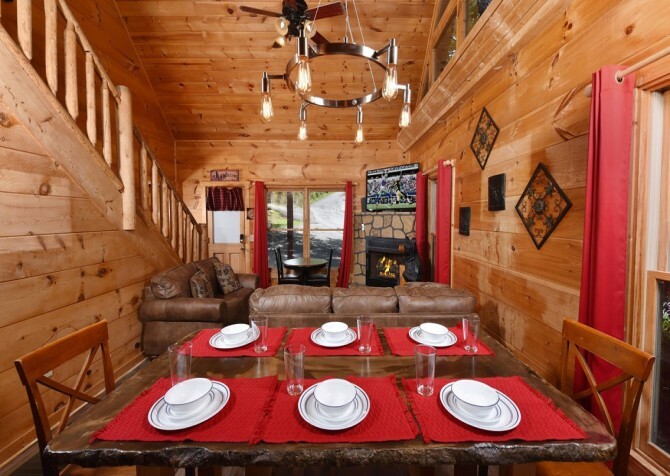 The 2-bedroom, 2-bathroom cabin sleeps up to 10 guests across 2 stories. 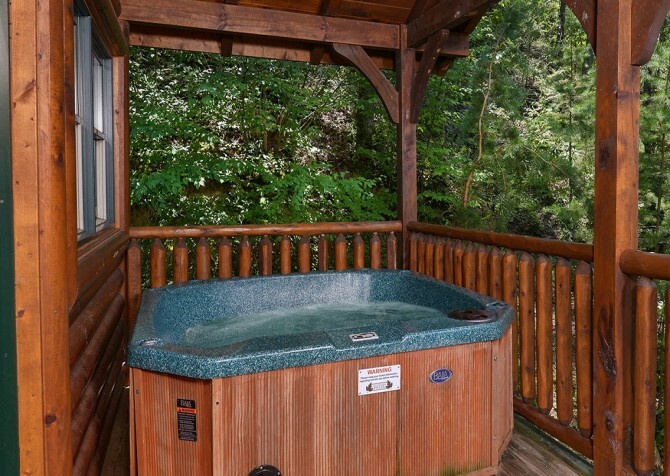 Vacation with another family and let your children have a blast with friends as you and your companions relax in the hot tub or hang out in the homey living room. 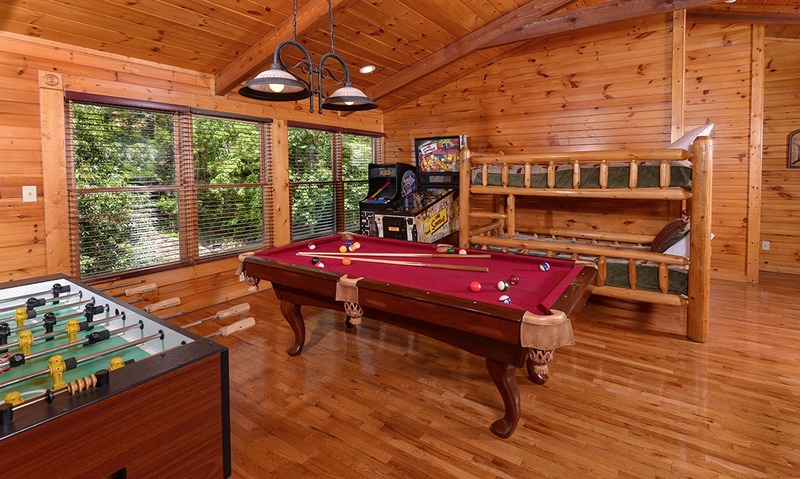 Kids and teens will love all the amenities of the game room and community pool, and you will love keeping everyone so easily entertained! 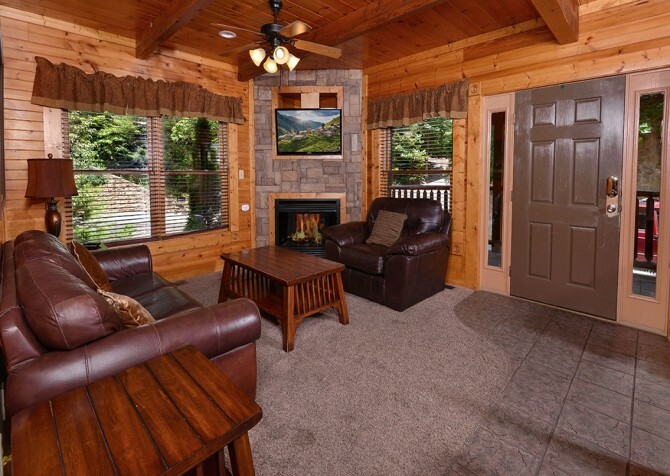 The Gatlinburg Falls resort community is conveniently located under 3 miles from downtown Gatlinburg! 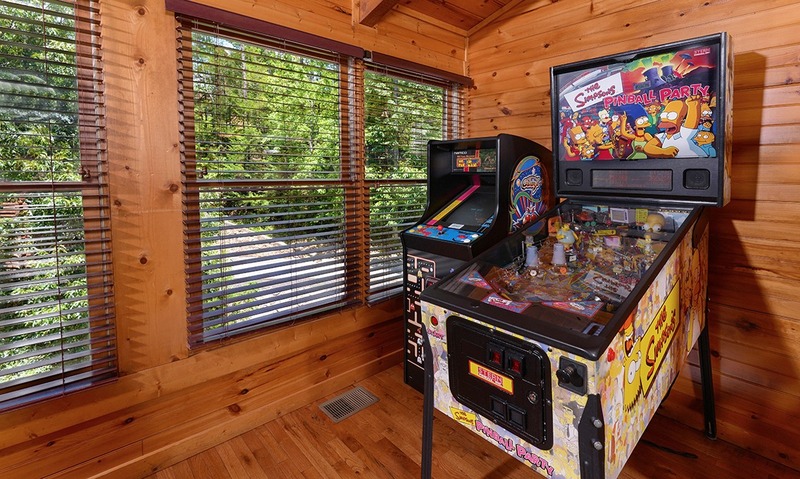 Easily make your way back to your cabin after a full day of fun at Ripley’s Believe It or Not! Odditorium, The Mysterious Mansion of Gatlinburg, and Fannie Farkle’s. 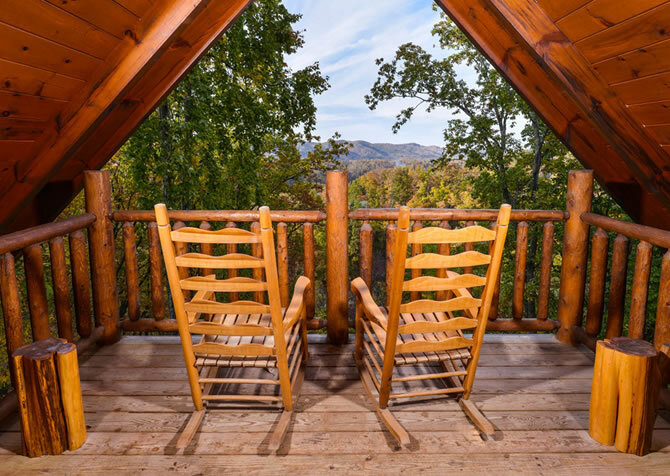 Soak in even more of the Smoky Mountain air and explore nature with the kids in the Great Smoky Mountains National Park. 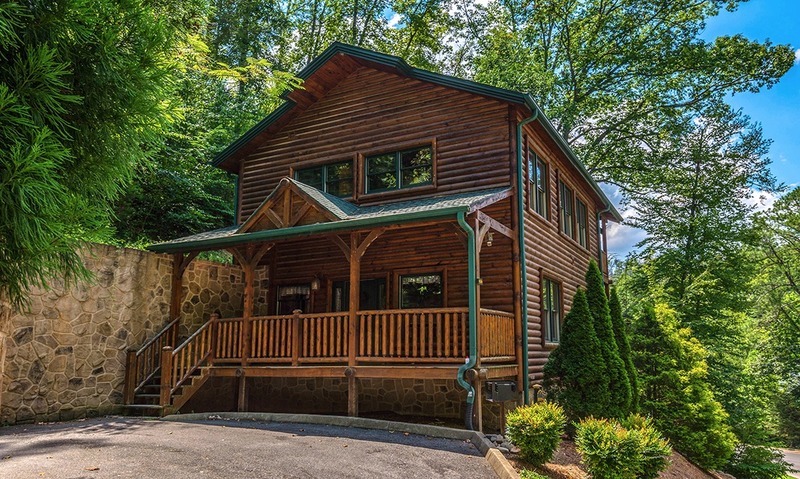 See unparalleled views of the mountains at Clingmans Dome, go horseback riding through dreamy mountain valleys at Cades Cove, or simply take a scenic drive through the mountains on Newfound Gap Road. With access to so many tourist and natural attractions, the warm wooden structure with natural accents, and the numerous amenities to enjoy, Smoky Mountain Escape is the perfect cabin stay for your Smoky Mountain getaway. Plop down in the cushy reading chair and kick your shoes off after your days hiking, shopping, and exploring. The living area, located just inside the front door, is a warm, welcoming space surrounded by the wood cabin walls, neutral carpets, and plush leather furniture. 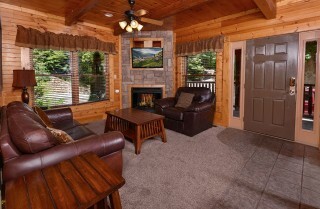 The tranquil space is soothing for those afternoon naps between vacation itinerary activities. Lounge on the couch in the soft afternoon light as you enjoy views of greenery just through the windows. 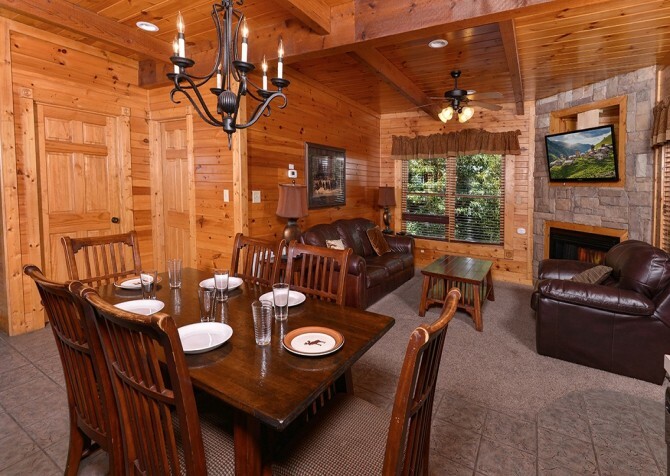 After dinner at the hilarious and dazzling Dolly Parton's Stampede, sit around to laugh, reminisce, and make plans for the next day. 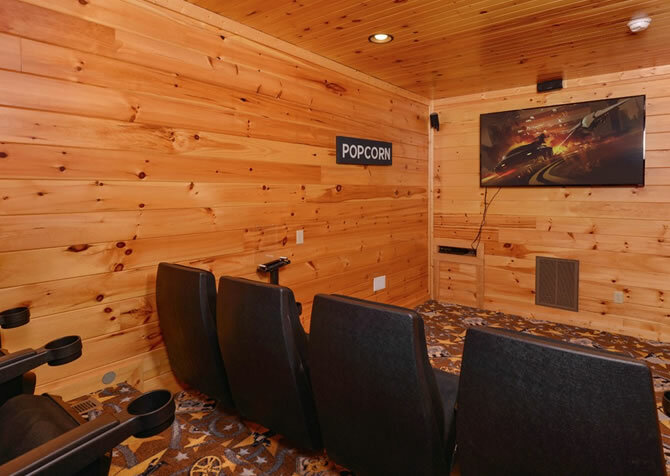 Put a big bowl of popcorn and all your sodas on the spacious wooden coffee table and get settled in for a movie night with the kids. 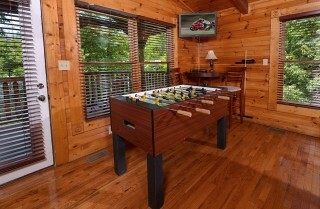 Play their favorite comedy or your favorite action flick on the large flatscreen TV mounted on the stone fireplace. 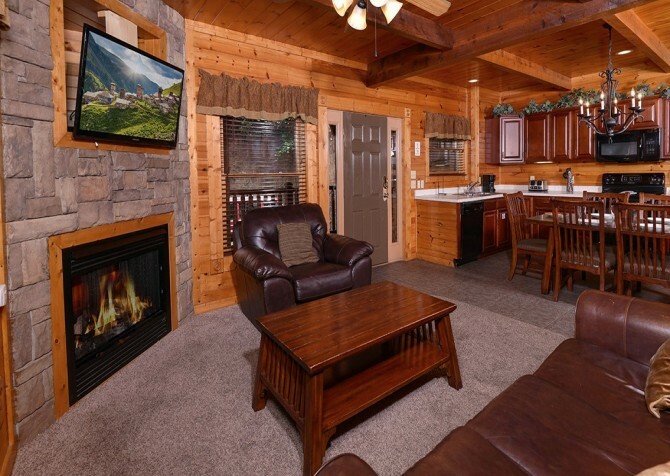 Sip your wine from the Smoky Mountain Winery or your hot chocolate you picked up from the Old Mill General Store in Pigeon Forge and enjoy a peaceful night by the fire in the comfort of your own Pigeon Forge cabin. You may have been roughing it on your hike to Abrams Falls in Cades Cove, but you certainly don’t have to adapt to the outdoors for meal preparation. 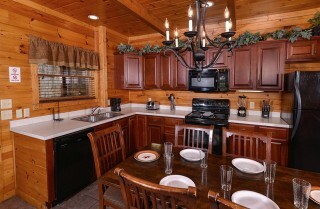 Modernity and mountain living are paired exquisitely in the kitchen of Smoky Mountain Escape. 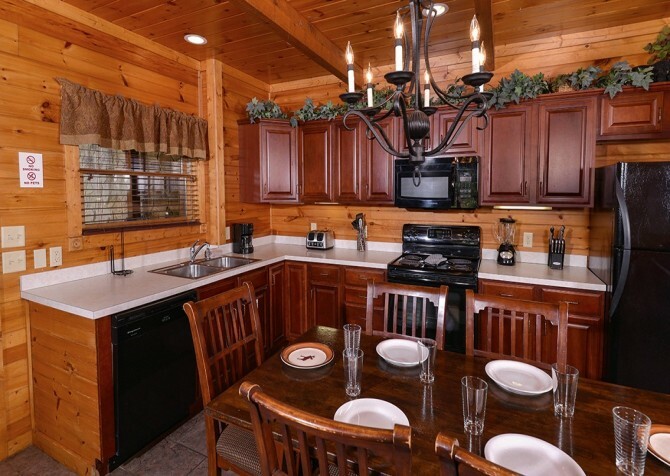 The spacious white countertops rest on and below smooth, dark wooden cabinetry, providing all the room you need to set out all your groceries and recipe ingredients. Make a delicious 3-course dinner or a hearty breakfast using all the tools provided at your fingertips. 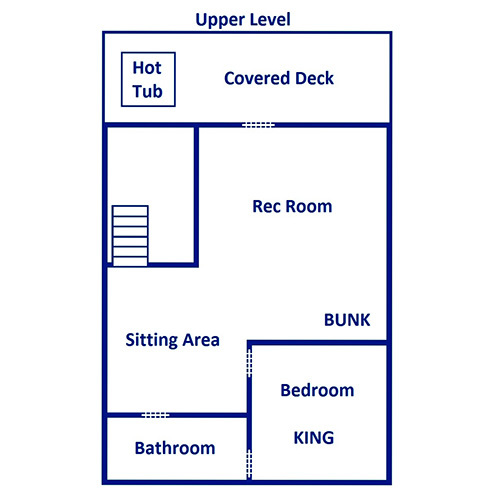 You can brew some fresh coffee, make a smoothie, or enjoy easy meals or leftovers via the microwave here. The sleek black appliances and tasteful lighting accentuate the beauty of this warm space. The elegant 6-chair dining room table set is very accommodating for sharing a tasty homemade cabin meal. 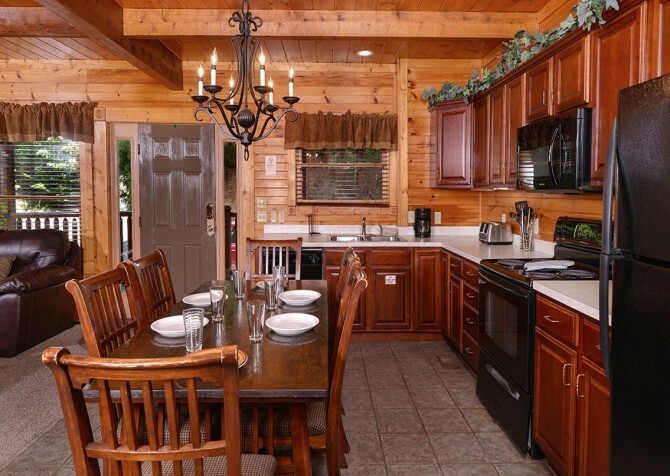 Just a few steps from the refrigerator and kitchen counters, you won’t have to fret about having enough room on the table for condiments or side dishes. Share a nice pancake breakfast at the table as the morning sunshine dances in from the living room windows. 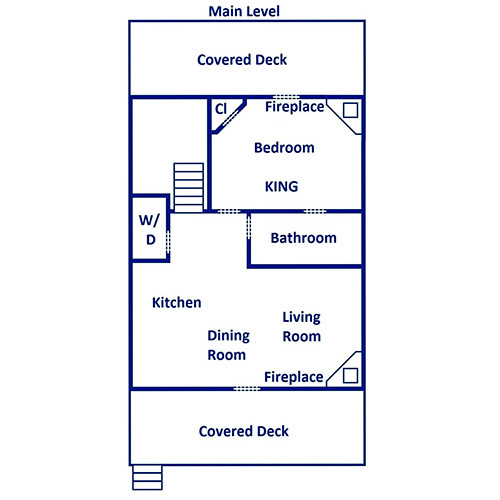 The open space leading to the living room makes it easy to accommodate spillover from the dining room table if you have some friends or family over for dinner. Or you can use this spot as your game-night hub, laughing until the late evening hours playing board games around the table after dinner. Sitting around the dining room table to eat, laugh, play games, and chat will be memories you’ll keep for a lifetime. 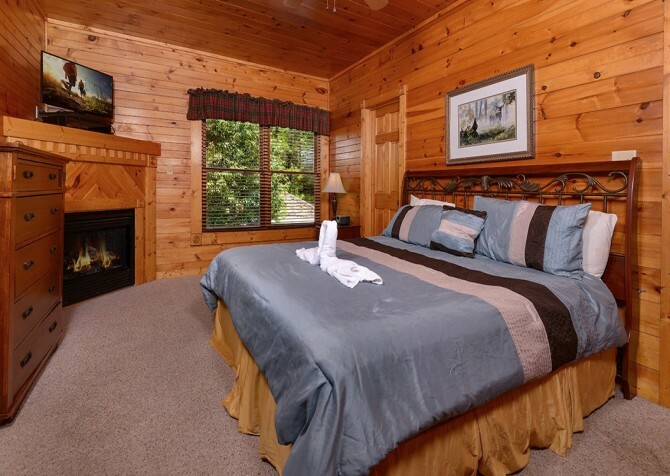 Smoky Mountain Escape has 2 bedrooms where you can escape the kids for a nap or just get a great night’s rest. 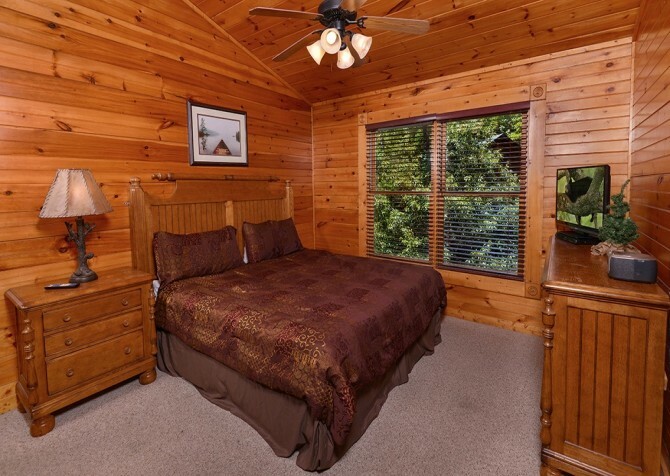 Read in the light of one of the reading lamps or fall asleep watching your favorite show. With king-size beds in each room, guests will have the space they need for a comfortable night. Enjoy a fire to yourselves in the main floor bedroom or get some private time with your current podcast obsession in the sunlight of the 2nd-floor bedroom. Both rooms offer dressers with space to unpack your suitcases and ceiling fans for staying cool on warmer summer nights. 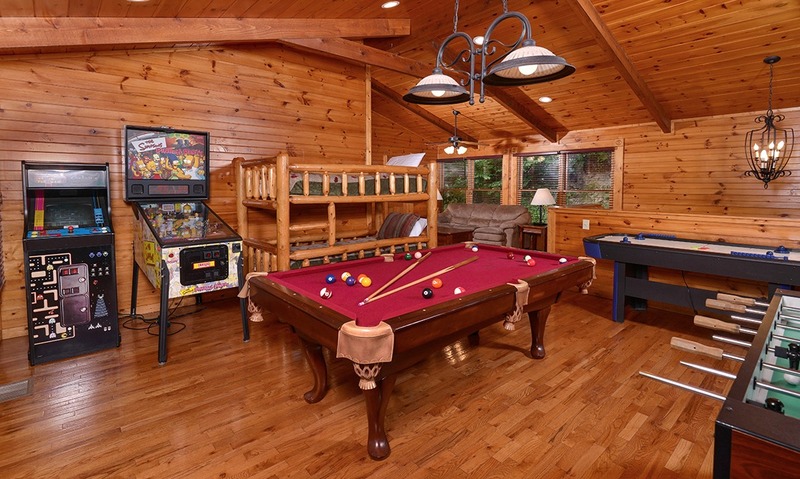 The upstairs loft area is not only where you can find a twin bunk bed set and the second of two sleeper sofas to accommodate all your guests, but it’s also where you can go to have some budget-friendly fun during days at the cabin. 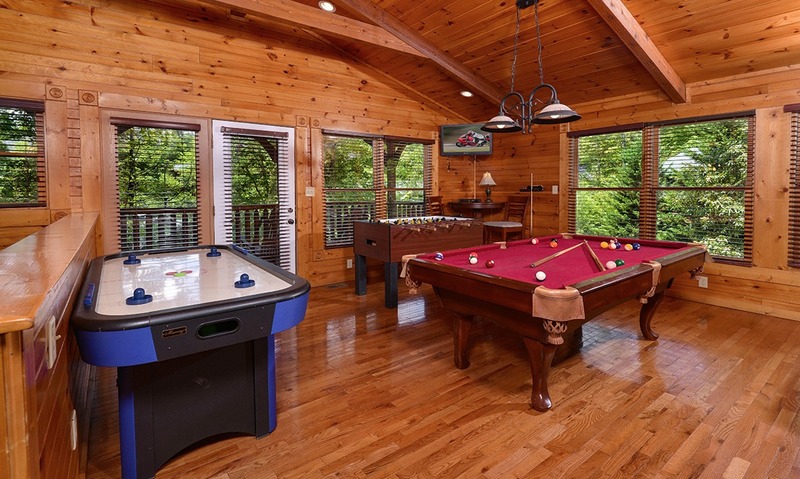 Shoot some pool with your friends while the kids play pinball or the arcade games, challenge someone to a game of air hockey, or play around with foosball for a fun day. Let your stress float away with the steam rising from the outdoor hot tub while you sip on some wine with friends. The rocking chairs on the porch – tucked privately behind the trees – offer a serene place to dive deeper into that book. Enjoy your morning coffee and newspaper in a whole new way as you immerse yourself into mountain cabin living each morning. 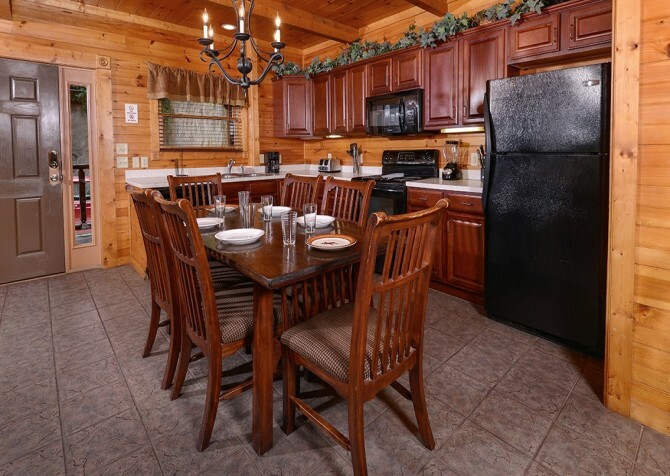 You’ll love grilling out with a cold drink in hand while the kids help set the table and grab condiments from the fridge. 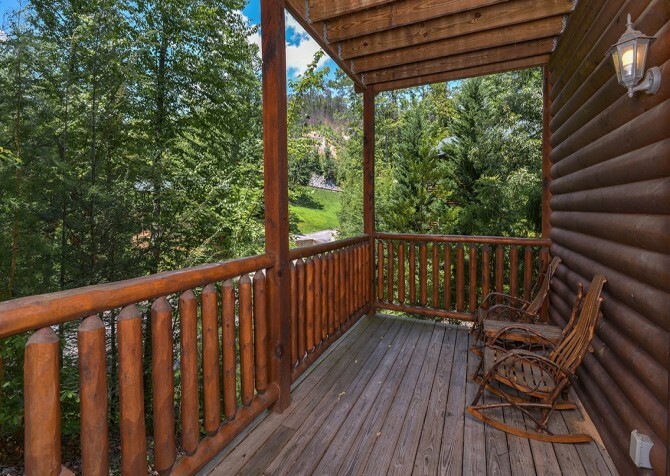 Walk out onto the front porch and down a few steps to grab those groceries from the car, because parking is easy in the spacious driveway and easily accessible from the entrance to your cabin. It makes carrying in suitcases, groceries and shopping bags hassle free! 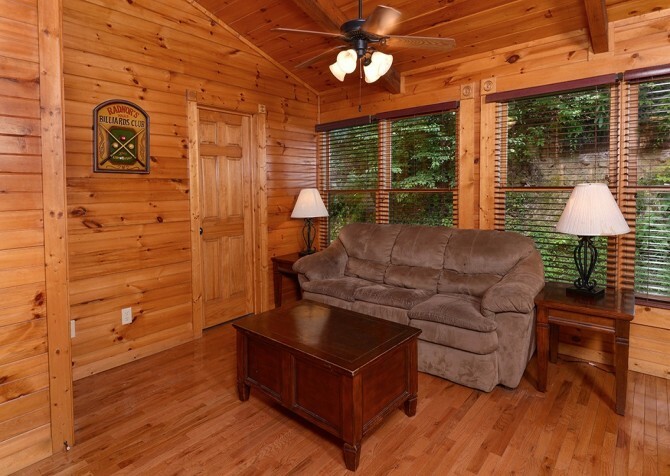 The cabin also offers wireless internet, so you can catch up on emails, buy tickets to area attractions, or see what Gatlinburg events are going on during your stay. 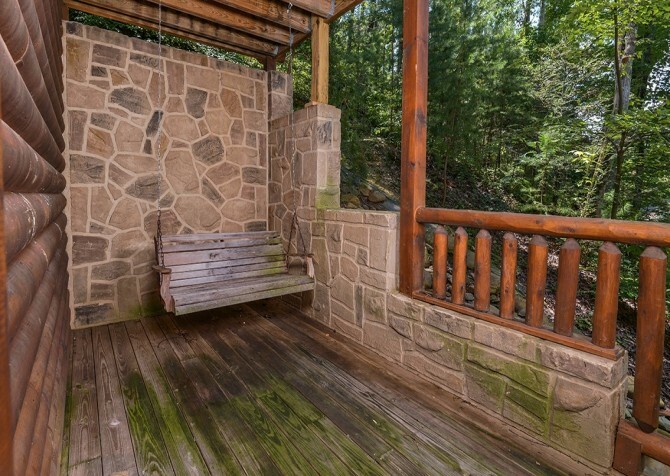 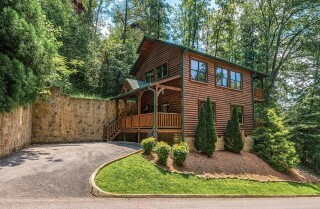 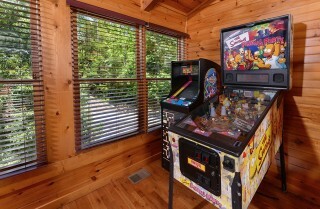 Smoky Mountain Escape is one of many cabins located in the Gatlinburg Falls resort community. As part of this resort, you will get to enjoy the relaxing community pool with numerous lounge chairs for soaking up some vitamin D while the kids splash around in the water or get their energy out on the playground. Gatlinburg Falls also has a large conference facility and event center, available by reservation, that is perfect for a wedding reception or group gathering like a church retreat or family reunion. Enjoy the smooth, easily navigated paved roads within the community. 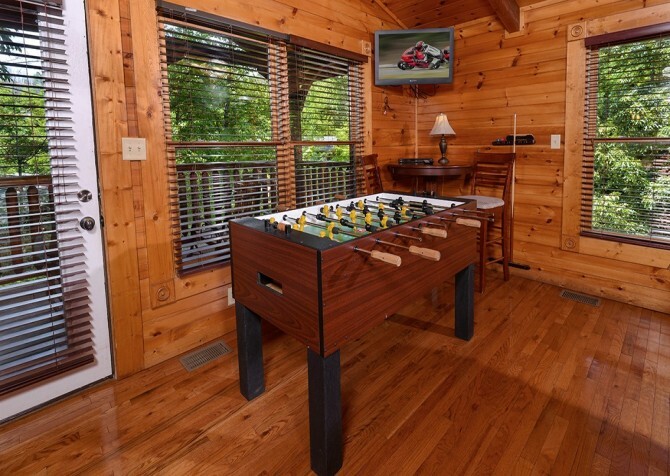 Staying so close to Gatlinburg and only a little under 8 miles from Pigeon Forge means there is tons of fun within a short drive. 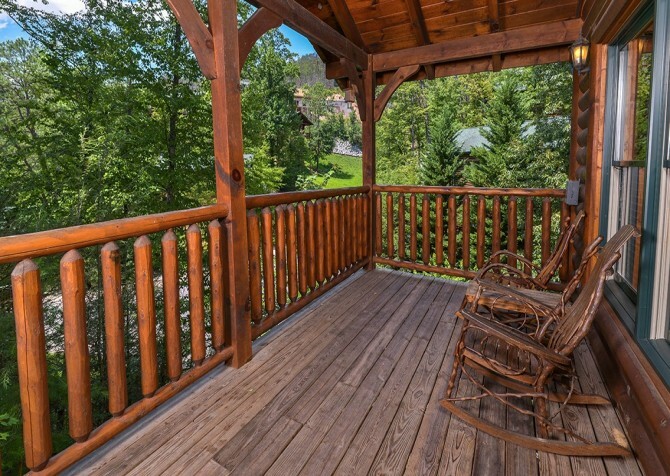 From romantic activities and family-friendly attractions to restaurants and unique shops, there’s always something to do for kids and adults! Reach into the shallow lagoon of Touch-A-Ray Bay and make friends with the stingrays; walk through the real-life simulation of a tropical rainforest filled with all kinds of critters; and explore underseas at Ripley’s Aquarium of the Smokies! At Fort Fun, have a ball playing mini-golf indoors or outdoors, test your thinking at escape games, or play around with bumper cars! Gem mining, arcade games, motion ride, and laser tag are more on the long list of ways to indulge the fun-loving kid in everyone. 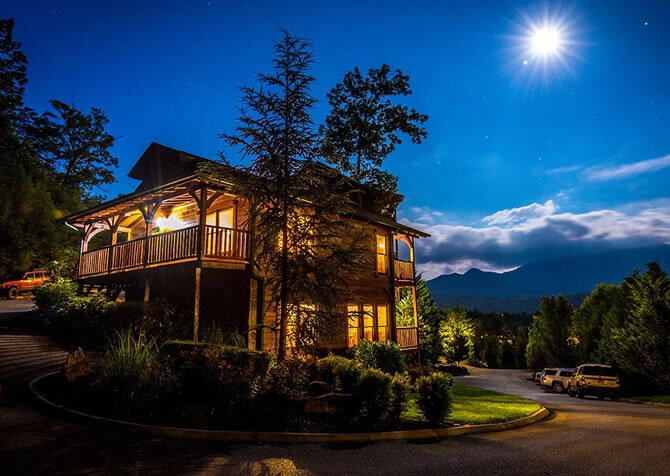 Get your fill of authentic Mexican cuisine hiding right in the middle of the Smoky Mountains. 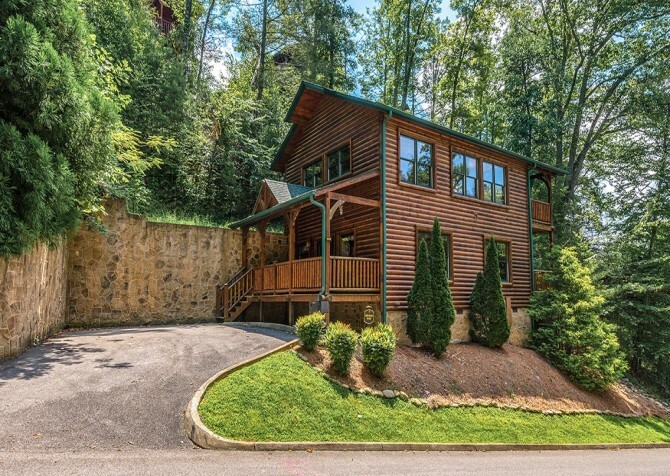 Sit back and enjoy views of the river and downtown Gatlinburg, margarita in hand, while you enjoy chips and queso on the beautiful patio of No Way Jose’s Gatlinburg!